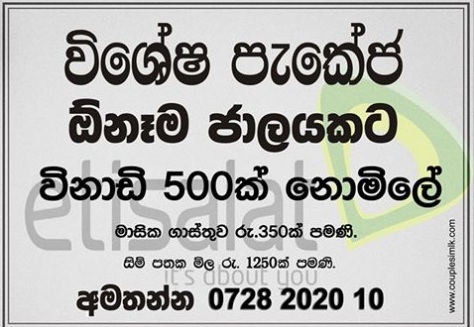 This is special package introduced by Etisalat Sri lanka, facilitate 500 minutes free for any mobile network including Dialog, Mobitel, Hutch, Airtel, Etisalat and SLT, Bell, Dialog CDMA Land lines. This Etisalat Special Package Monthly Rental is Rs.350/= Only. Now you can buy this special package for reasonable price (Total Price of one sim Rs. 1250.00). Important : This special package not for sale in Etisalat arcades.